Sarajevo (Cyrillic: Сарајево) (pronounced [sǎrajɛʋɔ]) is the capital and largest city of Bosnia and Herzegovina, with an estimated population of 327,633 people within its four municipalities. The urban area of Sarajevo extends beyond the administrative city limits, with an estimated population of 452,124 people. In the wider Sarajevo region there are more than 650,000 inhabitants. 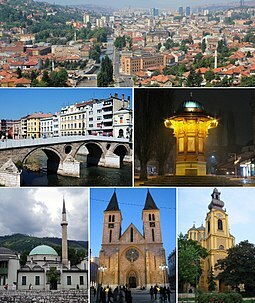 It is also the capital of the Federation of Bosnia and Herzegovina entity, as well as the center of the Sarajevo Canton. Nestled within the greater Sarajevo valley of Bosnia, it is surrounded by the Dinaric Alps and situated along the Miljacka River in the heart of Southeastern Europe and the Balkans. Sarajevo is the leading political, social and cultural center of Bosnia and Herzegovina, and its region-wide influence in politics, education, entertainment, media, fashion, science, and the arts contribute to its status as Bosnia and Herzegovina's major economic center. The city is famous for its traditional cultural and religious diversity, with adherents of Islam, Orthodoxy, Catholicism and Judaism coexisting there for centuries. Due to this long and rich history of religious and cultural variety, Sarajevo is often called the "Jerusalem of Europe" or "Jerusalem of the Balkans". It was, until recently in the 20th century, the only major European city to have a mosque, Catholic church, Orthodox church and synagogue within the same neighborhood. Sarajevo has been undergoing post-war reconstruction, and is the fastest growing city in Bosnia and Herzegovina. The travel guide series, Lonely Planet, has named Sarajevo as the 43rd best city in the world, and in December 2009 listed Sarajevo as one of the top ten cities to visit in 2010. In March 2012, Sarajevo won travel blog Foxnomad's "Best City to Visit" competition, beating out more than one hundred cities around the entire world. In 2011, Sarajevo was nominated to be the European Capital of Culture in 2014 and will be hosting the European Youth Olympic Festival in 2017. The earliest known name for the region of today's Sarajevo is Vrhbosna. Sarajevo is a slavicized word based on saray, the Turkish word for the governor's palace. The letter Y does not exist in the Bosnian version of the Latin alphabet. The "evo" portion may come from the term Saray Ovası first recorded in 1455, meaning "the plains around the palace". However, in his Dictionary of Turkish loanwords, Abdulah Škaljić maintains that the "evo" ending is more likely to have come from Slavic ending "evo", found in many other Slavic place names, such as Mukachevo, Kraljevo, Kičevo, etc., than from the Turkish ending "ova", as proposed by some. Sarajevo has had many nicknames. The earliest is Šeher, which is the term Isa-Beg Ishaković used to describe the town he was going to build. It is a Turkish word meaning an advanced city of key importance (şehir) which in turn comes from Persian شهر shahr (city). As Sarajevo developed, numerous nicknames came from comparisons to other cities in the Islamic world, i.e. "Damascus of the North". The most popular of these was "European Jerusalem". Some argue that a more correct translation of saray is government office or house. Saray is a common word in Turkish for a palace or mansion; a fortified government office, or house, would still be called a saray, if it maintained the general look of an office. Otherwise it would be called kale (castle). One of the earliest findings of settlement in the Sarajevo area is that of the Neolithic Butmir culture. The discoveries at Butmir were made on the grounds of the modern-day Sarajevo suburb Ilidža in 1893 by Austro-Hungarian authorities during the construction of an agricultural school. The area’s richness in flint was no doubt attractive to Neolithic man, and the settlement appears to have flourished. The settlement developed unique ceramics and pottery designs, which characterize the Butmir people as a unique culture. This was largely responsible for the International congress of archaeologists and anthropologists meeting in Sarajevo in 1894. Other scholars say that Vrhbosna was a major city located at the site of modern-day Sarajevo. Papal documents say that in 1238, a cathedral dedicated to Saint Paul was built in the city. Disciples of the notable saints Cyril and Methodius stopped by the region, founding a church at Vrelobosna. Whether or not the city was located at modern-day Sarajevo, the documents attest to its and the region's importance. Vrhbosna was a Slavic citadel from 1263 until it was occupied by the Ottoman Empire in 1429. Sarajevo was founded by the Ottoman Empire in the 1450s upon its conquest of the region, with 1461 used as the city’s founding date. The first Ottoman governor of Bosnia, Isa-Beg Ishaković, transformed the cluster of villages into a city and state capitol by building a number of key structures, including a mosque, a closed marketplace, a public bath, a hostel, and of course the governor’s castle (“Saray”) which gave the city its present name. The mosque was named “Careva Džamija” (the Tsar’s Mosque) in honor of the Sultan Mehmed II. With the improvements Sarajevo quickly grew into the largest city in the region. Many Christians converted to Islam at this time. The settlement was established as a city, named Bosna-Saraj, around the citadel in 1461. The name Sarajevo is derived from Turkish saray ovası, meaning the field around saray. The Ottoman Empire made Sarajevo an important administrative centre by 1850. The Austro-Hungarian occupation of Bosnia and Herzegovina happened in 1878 as part of the Treaty of Berlin, and complete annexation followed in 1908. 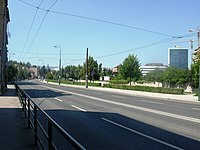 Sarajevo was industrialized by Austria-Hungary, who used the city as a testing area for new inventions, such as tramways, established in 1885, before installing them in Vienna. Architects and engineers wanting to help rebuild Sarajevo as a modern European capital rushed to the city. A fire that burned down a large part of the central city area (čaršija) left more room for redevelopment. The city has a unique blend of the remaining Ottoman city market and contemporary western architecture. Sarajevo has some examples of Secession- and Pseudo-Moorish styles that date from this period. The Austria-Hungarian period was one of great development for the city, as the Western power brought its new acquisition up to the standards of the Victorian age. Various factories and other buildings were built at this time, and a large number of institutions were both Westernized and modernized. For the first time in history, Sarajevo’s population began writing in Latin script. In the event that triggered World War I, Archduke Franz Ferdinand of Austria was assassinated, along with his wife Sophie, Duchess of Hohenberg in Sarajevo on 28 June 1914 by a self-declared Yugoslav, Gavrilo Princip. In the ensuing war, however, most of the Balkan offensives occurred near Belgrade, and Sarajevo largely escaped damage and destruction. During World War II the Kingdom of Yugoslavia put up an inadequate defense. Following a German bombing campaign, Sarajevo was captured on 15 April 1941 by the 16th Motorized infantry Division. The Axis powers created the Independent State of Croatia and included Sarajevo in its territory. On 12 October 1941 a group of 108 notable Muslim citizens of Sarajevo signed the Resolution of Sarajevo Muslims by which they condemned the persecution of Serbs organized by Ustaše, made a distinction between the Muslims who participated in such persecutions and the rest of the Muslim population, presented information about the persecutions of Muslims by Serbs, and requested security for all citizens of the country, regardless of their identity. The city was bombed by the Allies from 1943 to 1944. The Yugoslav Partisan movement was represented in the city. Resistance was led by a NLA Partisan named "Walter" Perić. He died while leading the final liberation of the city on 6 April 1945. Many of the WWII shell casings that were used during the attacks have been carved and polished in Sarajevo tradition and are sold as art. Following the liberation, Sarajevo was the capital of the Socialist Republic of Bosnia and Herzegovina within the Socialist Federal Republic of Yugoslavia. The Republic Governament invested heavily in Sarajevo, building many new residential blocks in Novi Grad Municipality and Novo Sarajevo Municipality, while simultaneously developing the city's industry and transforming Sarajevo into one of the modern cities, in SFRYugoslavia and SR Bosnia. From a post-war population of 115,000, by the end of Yugoslavia, Sarajevo had 600,000 people. Sarajevo grew rapidly as it became an important regional industrial center in Yugoslavia. The Vraca Memorial Park, a monument for victims of World War II, was dedicated on 25 November, the "Day of Statehood of Bosnia and Herzegovina" when the ZAVNOBIH held their first meeting in 1943. The crowning moment of Sarajevo’s time in Socialist Yugoslavia was the 1984 Winter Olympics. Sarajevo beat Sapporo, Japan; and Falun/Göteborg, Sweden for the privilege of hosting the games. They were followed by an immense boom in tourism, making the 1980s one of the city's best decades in a long time. The Bosnian War for independence resulted in large-scale destruction and dramatic population shifts during the Siege of Sarajevo between 1992 and 1995. Thousands of Sarajevans lost their lives under the constant bombardment and sniper shooting at civilians by the Serb forces during the siege.. It is the longest siege of a capital city in the history of modern warfare. Serb forces of the Republika Srpska and the Yugoslav People's Army besieged Sarajevo, the capital city of Bosnia and Herzegovina, from 5 April 1992 to 29 February 1996 during the Bosnian War. Today, Sarajevo is one of the fastest developing cities in the region. Various new modern buildings have been built, most significantly the Bosmal City Center, BBI Centar and the Avaz Twist Tower, which is the tallest skyscraper in the Balkans. A new highway was recently (2006–2011) completed between Sarajevo and the city of Kakanj. Due to growth in population, tourism and airport traffic the service sector in the city is developing fast and welcoming new investors from various businesses. The near-future Sarajevo will have one of the most developed commercial infrastructures in Southeastern Europe. The business enclave to be known collectively as the Sarajevo City Center will be one of the largest and most modern shopping and business centers in the region upon its completion in early 2013. Airport Center Sarajevo which will be connected directly to the new airport terminal will offer a great variety of brands, products and services. Sarajevo's climate exhibits influences of oceanic (Cfb), humid continental (Dfa) and humid subtropical (Cfa) zones, with four seasons and uniformly spread precipitation. The proximity of the Adriatic Sea moderates Sarajevo's climate somewhat, although the mountains to the south of the city greatly reduce this maritime influence. The average yearly temperature is 10 °C (50 °F), with January (−0.5 °C (31.1 °F) avg.) being the coldest month of the year and July (19.7 °C (67.5 °F) avg.) the warmest. The highest recorded temperature was 40.7 °C (105 °F) on 19 August 1946, and on 23 August 2008 (41.0) while the lowest recorded temperature was −26.2 °C (−15.2 °F) on 25 January 1942. On average, Sarajevo has 6 days where the temperature exceeds 32 °C (89.6 °F) and 4 days where the temperature drops below −15 °C (5.0 °F) per year. The city typically experiences mildly cloudy skies, with an average yearly cloud cover of 45%. The city comprises four municipalities Centar, Novi Grad, Novo Sarajevo, and Stari Grad. Each operate their own municipal government, united they form one city government with its own constitution. The executive branch (Template:Lang-bs) consists of a mayor, with two deputies and a cabinet. The legislative branch consists of the City Council, or Gradsko Vijeće. The council has 28 members, including a council speaker, two deputies, and a secretary. Councilors are elected by the municipality in numbers roughly proportional to their population. The city government also has a judicial branch based on the post-transitional judicial system as outlined by the High Representative's “High Judicial and Prosecutorial Councils”. After the years of war, Sarajevo's economy was subject to reconstruction and rehabilitation programs. Amongst economic landmarks, the Central Bank of Bosnia and Herzegovina opened in Sarajevo in 1997 and the Sarajevo Stock Exchange began trading in 2002. The city's large manufacturing, administration, tourism sector, combined with a large informal market, makes it the strongest economic regions of Bosnia and Herzegovina. In 2013 256.628 tourists visited Sarajevo, up 10.8% compared to 2011, giving 504.929 overnight stays, which is 12.9% more than in 2010. In 2011 Sarajevo's GDP is estimated to be 16.76 billion US$ by the Central Bank of Bosnia, which comprises 37% of the total GDP of Bosnia and Herzegovina. Today, Sarajevo's population is not known clearly and is based on estimates contributed by the United Nations Statistics Division and the Federal Office of Statistics of the Federation of Bosnia and Herzegovina, among other national and international non-profit organizations. As of June 2011, the population of the city's four municipalities is estimated to be 411,161, whereas the Sarajevo Canton population is estimated at 578,757. With an area of 1,280 square kilometres (490 sq mi), Sarajevo has a population density of about 2,173 inhabitants per square kilometre (5,630 /sq mi). The Novo Sarajevo municipality is the most densely populated part of Sarajevo with about 7,524 inhabitants per square kilometre (19,490 /sq mi), while the least densely populated is the Stari Grad, with 2,742 inhabitants per square kilometre (7,100 /sq mi). The war changed the ethnic and religious profile of the city. It had long been a multicultural city, and often went by the nickname of "Europe's Jerusalem". At the time of the 1991 census, 49.2 per cent of the city's population of 527,049 were Bosniaks, 29.8 percent Serbs, 10.7 percent Yugoslavs, 6.6 percent Croats and 3.6 percent other ethnicities (Jews, Romas, etc.). By 2002, 79.6 per cent of the canton's population of 401,118 were Bosniak, 11.2 percent Serb, 6.7 percent Croat and 2.5 percent others (Jews, Romas, etc.). The Federation of Bosnia and Herzegovina census that the 2002 data is based on only included these four ethnic categories, and academic Fran Markowitz states that it is not clear "whether the state acted by fiat to turn Muslims (and perhaps Jugoslaveni [Yugoslavs] and Ostali [others]) into Bosniaks, or if its citizens through their self-declarations made that switch in identity". Many Serbs left urban areas including Sarajevo during the conflict, but the falling number of Serbs is also partly due to the redrawing of municipal boundaries as part of the Dayton Agreement. Sarajevo's location in a valley between mountains makes it a compact city. Narrow city streets and a lack of parking areas restrict automobile traffic but allow better pedestrian and cyclist mobility. The two main roads are Titova Ulica (Street of Marshal Tito) and the east-west Zmaj od Bosne (Dragon of Bosnia) highway (E761). Sarajevo is Bosnia's main intersection and the most passable city in Bosnia and Herzegowina and the third in region. The city is connected to all the other major cities by highway or national road like Zenica, Banja Luka, Tuzla, Mostar, Goražde and Foča. Tourists from Central Europe and elsewhere visiting Dalmatia driving via Budapest thru Sarajevo also contribute to the traffic congestion in and around Sarajevo. The trans-European highway, Corridor 5C, runs through Sarajevo connecting it to Budapest in the north, and Ploče at the Adriatic sea in the south. The highway is built by the government and should cost 3.5 billion Euros. Up until March 2012, the Federation of Bosnia and Herzegovina invested around 600 million Euros in the A1. The section of Sarajevo-Kakanj is completed, remaining section between Kakanj and Zenica should be operational by Q1 2014. Sarajevo's electric tramways, in operation since 1885, are the oldest form of public transportation in the city. Sarajevo had the first full-time (dawn to dusk) tram line in Europe, and the second in the world. Opened on New Year's Day in 1885, it was the testing line for the tram in Vienna and the Austro-Hungarian Empire, and operated by horses. Originally built to 760 mm (30 in) narrow gauge (Bosnian gauge), the present system in 1960 was upgraded to standard gauge (1435 mm). The trams played a pivotal role in the growth of the city in the 20th century. Sarajevo-based architect, Muzafer Osmanagić, in order to solve traffic congestion in Bosnia's capital, has proposed a study called "Eco Energy 2010-2015", idealizing a subway system underneath the bed of the river Miljacka. The first line of Metro Sarajevo should connect Basčarsija with Otoka. This line should cost some 150 million KM and be financed by the European Bank for Reconstruction and Development. Plans for extension of the passenger terminal, together with upgrading and expanding the taxiway and apron, are planned to start in Fall 2012. The existing terminal will be expanded by approximately 7,000 square metres. The upgraded airport will also be directly linked to the commercial retail center Sarajevo Airport Center, making it easier for tourists and travellers to spend their time before flight boarding shopping and enjoying the many amenities that will be offered. Sarajevo is directly connected with Istanbul-Atatürk, Istanbul-Sabiha Gökçen, Munich, Vienna, Zagreb, Ljubljana, Belgrade, Skopje, Zurich, Stuttgart, Cologne, Copenhagen, Oslo-Gardermoen, Stockholm-Arlanda, Beirut, Tripoli and Kuwait. Also FlyDubai intends to connect the city with Dubai in 2013. Sarajevo has daily international connections to Zagreb, Belgrade, Budapest and Ploče. There are also numerous connections between Sarajevo and all major cities within Bosnia and Herzegovina. As the capital and largest city of Bosnia and Herzegovina, Sarajevo is the main center of the country's media. Most of the communications and media infrastructure was destroyed during the war but reconstruction monitored by the Office of the High Representative has helped to modernize the industry as a whole. For example, internet was first made available to the city in 1995. The Radiotelevision of Bosnia-Herzegovina is Sarajevo's public television station, one of three in Bosnia and Herzegovina. Other stations based in the city include NRTV “Studio 99”, NTV Hayat, TV 1, Open Broadcast Network, TV Kantona Sarajevo and Televizija Alfa. Historically, Sarajevo has been home to several famous Bosnian poets, scholars, philosophers, and writers during the Ottoman Empire. To list only a very few; Nobel Prize-winner Vladimir Prelog is from the city, as is Academy Award-winning director Danis Tanović and multiple award-winning writer Aleksander Hemon. One of the region's most prolific and prominent poets, writers and screenwriters, Abdulah Sidran is also a Sarajevo native. Nobel Prize-winner Ivo Andrić attended high school in Sarajevo for two years. Sarajevo is also the home of the East West Theatre Company, the only independent theater company in Bosnia and Herzegovina. Bijelo Dugme was a highly influential former Yugoslav rock band, based in Sarajevo. Sarajevo is and has historically been one of the most important musical enclaves in the region. The Sarajevo school of pop rock developed in the city between 1961 and 1991. This type of music began with bands like Indexi, Pro Arte and singer/song writer Kemal Monteno. It continued into the 1980s, with bands such as Plavi Orkestar, Crvena Jabuka, Divlje Jagode and Vatreni Poljubac, by most accounts, pioneering the regional rock and roll movement. Sarajevo was also the home and birthplace of arguably the most popular and influential Yugoslav rock band of all time, Bijelo Dugme, somewhat of a Bosnian parallel to the Rolling Stones, in both popularity and influence. Sarajevo was also the home of a very notable post-punk urban subculture known as the New Primitives, which began during the early 1980s with the Baglama Band which was banned shortly after first LP and was brought into the mainstream through bands such as Zabranjeno Pušenje and Elvis J. Kurtović & His Meteors, as well as the Top Lista Nadrealista radio, and later television show. Other notable bands considered to be part of this subculture are Bombaj Štampa and Šume i Gore. Besides and separately from the New Primitives, Sarajevo is the hometown to one of the most significant ex-Yugoslavian alternative industrial-noise bands, SCH (1983–current). Perhaps more importantly, Sarajevo in the late 19th and throughout the 20th century was home to a burgeoning and large center of Sevdalinka record-making and contributed greatly to bringing this historical genre of music to the mainstream, which had for many centuries been a staple of Bosnian culture. Songwriters and musicians such as Himzo Polovina, Safet Isović, Zaim Imamović, Zehra Deović, Nada Mamula (who lived and worked for many years in Sarajevo), Meho Puzić and many more composed and wrote some of their most important pieces in the city. Many newer Sarajevo-baseed bands have also found a name and established themselves in Sarajevo, such as Regina who also had two albums out in Yugoslavia and Letu Štuke, who actually formed their band in Yugoslavia with the famous Bosnian-American writer Aleksandar Hemon and got their real breakthrough later in the 2000s. Sarajevo is now home to an important and eclectic mix of new bands and independent musicians, which continue to thrive with the ever-increasing number of festivals, creative showcases and concerts around the country. The city is also home to the region's largest jazz festival, the Sarajevo Jazz Festival (see "Festival" section below this). Sarajevo is internationally renowned for its eclectic and diverse selection of festivals. The Sarajevo Film Festival was established in 1995 during the Bosnian War and has become the premier and largest film festival in the Balkans and South-East Europe. The Sarajevo Winter Festival, Sarajevo Jazz Festival and Sarajevo International Music Festival are well-known, as is the Baščaršija Nights festival, a month-long showcase of local culture, music, and dance. The most popular underground festival is Sarajevo Metal Fest, held a few times a year in various editions. The Sarajevo Film Festival has been hosted at the National Theater, with screenings at the Open-air theater Metalac and the Bosnian Cultural Center, all located in downtown Sarajevo and has been attended by celebrities such as Angelina Jolie, Brad Pitt, Orlando Bloom, Daniel Craig, John Malkovich, Morgan Freeman, Steve Buscemi, Bono Vox (Bono holds dual Bosnian and Irish citizenship and is an honorary citizen of Sarajevo), Nick Cave, Coolio, Stephen Frears, Michael Moore, Gérard Depardieu, Darren Aronofsky, Sophie Okonedo, Gillian Anderson, Kevin Spacey and many more. Asim Ferhatović Hase Stadium, home to FK Sarajevo, is located in Betanja Street, Sarajevo. Football (soccer) is popular in Sarajevo; the city hosts FK Sarajevo and FK Željezničar, which both compete in European and international cups and tournaments and are have a very large trophy cabinet in the former Yugoslavia as well as independent Bosnia and Herzegovina. Other notable soccer clubs are FK Olimpik and SAŠK. Another popular sport is basketball; the basketball club KK Bosna Sarajevo won the European Championship in 1979 as well as many Yugoslav and Bosnian national championships making it one of the greatest basketball clubs in the former Yugoslavia. The chess club, Bosna Sarajevo, has been a championship team since the 1980s and is the third ranked chess club in Europe, having won four consecutive European championships in the nineties. RK Bosna also competes in the European Champions League and is considered one of the most well organised handball clubs in South-Eastern Europe with a very large fan base and excellent national, as well as international results. Sarajevo often holds international events and competitions in sports such as tennis and kickboxing. Rock climbing is popular; rock-climbing events and practices are held at Sarajevo's Dariva area, where there is also an extensive network of biking trails. ^ a b c Stilinovic, Josip (3 January 2002). "In Europe's Jerusalem", Catholic World News. The city’s principal mosques are the Gazi Husrev-Bey’s Mosque, or Begova Džamija (1530), and the Mosque of Ali Pasha (1560–61). Retrieved on 5 August 2006. ^ a b Benbassa, Esther; Attias, Jean-Christophe (2004). The Jews and their Future: A Conversation on Judaism and Jewish Identities. London: Zed Books. p. 27. ISBN 1-84277-391-7. http://books.google.com/books?id=AxxBPfEk3_0C&q=Sarajevo#v=snippet&q=Sarajevo&f=false. ^ a b "Visit Sarajevo: A Brief History of the City". Visit Sarajevo. http://www.visitsarajevo.ba/history. Retrieved 28 March 2012. ^ a b "Intercity and International Cooperation of the City of Zagreb". 2006–2009 City of Zagreb. http://www1.zagreb.hr/mms/en/index.html. Retrieved 23 June 2009. ^ "Sarajevo: The economic, administrative, cultural and educational center of Bosnia and Herzegovina". Mediterranea News. 12 May 2011. http://www.mediterraneanews.com/index/2011/05/sarajevo-the-economic-administrative-cultural-and-educational-center-of-bosnia-and-herzegovina/. Retrieved 5 April 2012. ^ daenet d.o.o.. "Sarajevo Official Web Site : Economy". Sarajevo.ba. http://www.sarajevo.ba/en/stream.php?kat=144. Retrieved 5 April 2012. ^ Malcolm, Noel (1996). Bosnia: A Short History [Paperback]. London: NYU Press. p. 364. ISBN 978-0-8147-5561-7. ^ a b "Lonely Planet: Best Cities in the World". Lonely Planet. ASIN 1741047315. ^ Connelly, Charlie (8 October 2005). "The New Siege of Sarajevo". The Times (UK). http://www.timesonline.co.uk/tol/news/world/europe/article575571.ece. Retrieved 10 May 2010. ^ a b "Lonely Planet's Top 10 Cities 2010 | Lonely Planet's Top 10 Cities 2010". News.com.au. http://www.news.com.au/travel/galleries/gallery-e6frflw0-1225794915428?page=2. Retrieved 19 January 2010. ^ "Nomination of Sarajevo for European Capital of Culture 2014". BH-News.com. http://www.bh-news.com/en/vijest_det.php?vid=3827&r=1. Retrieved 15 September 2011. ^ "Sarajevo: With Sarajevo as Europe's Capital of Culture 2014 we could send an... - 12/05/2011 - EPP Group". Group of the European People's Party (Christian Democrats) in the European Parliament. http://www.eppgroup.eu/press/showpr.asp?prcontroldoctypeid=1&prcontrolid=10331&prcontentid=17480&prcontentlg=en. Retrieved 15 September 2011. ^ Hazim Šabanović (1959) (in Serbo-Croatian). Bosanski pašaluk: postanak i upravna podjela. Naučno društvo NR Bosne i Hercegovine. pp. 28–37. UDC 94(497.6)"14/17". http://books.google.com/books?id=kkQQAAAAIAAJ. Retrieved 11 September 2012. ^ II – PROCEDURE PRIOR TO DECISION. "Roman remains at Ilidža, the archaeological site", Bosnia and Herzegovina Commission to Preserve National Monuments, Retrieved on 3 August 2006. ^ FICE (International Federation of Educative Communities) Congress 2006. Sarajevo – History. Congress in Sarajevo. Retrieved on 3 August 2006. ^ Hartmann, Florence (July 2007). "A statement at the seventh biennial meeting of the International Association of Genocide Scholars". Helsinki. http://www.helsinki.org.rs/tjgenocide_t01.html. Retrieved 11 May 2010. ^ a b Strange, Hannah (12 December 2007). "Serb general Dragomir Milosevic convicted over Sarajevo siege". The Times (UK). http://www.timesonline.co.uk/tol/news/world/europe/article3039582.ece. Retrieved 10 May 2010. ^ Bassiouni, Cherif (27 May 1994). "Final report of the United Nations Commission of Experts established pursuant to security council resolution 780". United Nations. http://www.ess.uwe.ac.uk/comexpert/ANX/VI-01.htm. Retrieved 10 May 2010. ^ "BiH Tourism Assessment - Analysis of Sarajevo, Herzegovina and Krajina Tourism Regions and Recommendations for Product Development, Marketing and Destination Management |Expo". Exportcouncil.ba. http://www.exportcouncil.ba/eng/index.php?option=com_content&view=article&id=107:bih-tourism-assessment-analysis-of-sarajevo-herzegovina-and-krajina-tourism-regions-and-recommendations-for-product-development-marketing-and-destination-management&catid=44:key-sectors-and-strategy-&Itemid=14. Retrieved 5 April 2012. ^ "Home". Sarajevo City Center. http://www.sarajevocitycenter.com/?jezik=eng. Retrieved 5 April 2012. ^ a b "A new shopping experience in Sarajevo!". Airportcentersarajevo.com. http://www.airportcentersarajevo.com/info.php. Retrieved 5 April 2012. ^ Lacan, Igor; McBride, Joe R. (2009). "War and trees: The destruction and replanting of the urban and peri-urban forest of Sarajevo, Bosnia and Herzegovina". Urban Forestry & Urban Greening 8 (3): 133–148 . DOI:10.1016/j.ufug.2009.04.001. ^ "Weatherbase: Historical Weather for Sarajevo, Bosnia and Herzegovina". Weatherbase. http://www.weatherbase.com/weather/weather.php3?s=35331&cityname=Sarajevo-Federacija-Bosne-I-Hercegovine-Bosnia-and-Herzegovina&units=metric. Retrieved April 17, 2013. ^ a b c d e f g h i daenet d.o.o.. "Sarajevo Official Web Site : Sister cities". Sarajevo.ba. http://www.sarajevo.ba/en/stream.php?kat=160. Retrieved 6 May 2009. ^ "Official portal of City of Skopje – Skopje Sister Cities". 2006–2009 City of Skopje. http://www.skopje.gov.mk/EN/DesktopDefault.aspx?tabindex=0&tabid=69. Retrieved 14 July 2009. ^ "Fraternity cities on Sarajevo Official Web Site". City of Sarajevo 2001–2008. http://www.sarajevo.ba/en/stream.php?kat=147. Retrieved 9 November 2008. ^ "Kardeş Şehirler". Bursa Büyükşehir Belediyesi Basın Koordinasyon Merkez. Tüm Hakları Saklıdır. http://www.bursa.bel.tr/kardes-sehirler/sayfa/261/. Retrieved 2013-07-27. ^ "Sister Cities of Istanbul". http://www.greatistanbul.com/sister_cities.htm. Retrieved 8 September 2007. ^ Erdem, Selim Efe (3 November 2003). "İstanbul'a 49 kardeş" (in Turkish). Radikal. http://www.radikal.com.tr/haber.php?haberno=94185. "49 sister cities in 2003"
^ "Kardeş Kentleri Listesi ve 5 Mayıs Avrupa Günü Kutlaması [via WaybackMachine.com"] (in Turkish). Ankara Büyükşehir Belediyesi - Tüm Hakları Saklıdır. Archived from the original on 14 January 2009. http://web.archive.org/web/20090114033014/http://www.ankara-bel.gov.tr/AbbSayfalari/hizmet_birimleri/dis_dairesi_baskanligi/avrupa_gunu_kutlamasi.aspx. Retrieved 2013-07-21. ^ "Sister City – Budapest". Official website of New York City. http://www.nyc.gov/html/unccp/scp/html/sc/budapest_main.shtml. Retrieved 14 May 2008. ^ "Coventry - Twin towns and cities". Coventry City Council.. Archived from the original on 2013-04-14. http://web.archive.org/web/20130412062545/http://www.coventry.gov.uk/directory/25/twin_towns_and_cities. Retrieved 2013-08-06. ^ "Official agreement paper between Sarajevo and Madrid (Spanish and Bosnian languages)". http://www.madrid.es/UnidadWeb/Contenidos/EspecialInformativo/RelacInternac/RRII/HermanamientosyAcuerdos/Files/Sarajevo.pdf. ^ "Official Barcelona Website: Sister Cities". Ajuntament de Barcelona 1995–2008. http://w3.bcn.es/XMLServeis/XMLHomeLinkPl/0,4022,229724149_257215678_1,00.html. Retrieved 11 November 2008. ^ "Kanton Sarajevo: Više turista u 2011". Vijesti.ba. http://www.vijesti.ba/vijesti/bih/67677-Kanton-Sarajevo-Vise-turista-2011.html. Retrieved 2013-03-12. ^ "Statistički Godišnjaci/Ljetopisi". Fzs.ba. http://www.fzs.ba/god.htm. Retrieved 2013-03-12. ^ "First release". Federal Office of Statistics, Federation of Bosnia and Herzegovina. 31 August 2011. p. 3. http://www.fzs.ba/saopcenja/2011/14.2.1.pdf. Retrieved 31 August 2011. ^ Markowitz 2007, p. 55. ^ Bollens 2007, p. 95. ^ ekapija.ba - Metro rail in Sarajevo? ^ Zahid Krkic. "Sarajevo International Airport by Zahid Krkic -Dobro dosli-Welcome- Willkommen". Fortunecity.com. http://www.fortunecity.com/oasis/tropicana/533/. Retrieved 5 April 2012. ^ "EX-YU aviation news: Sarajevo expansion to begin in 2012". Exyuaviation.blogspot.com. 17 September 2011. http://exyuaviation.blogspot.com/2011/09/sarajevo-expansion-to-begin-in-2012.html. Retrieved 5 April 2012. ^ "Al Jazeera makes its Balkan debut | Europe | Deutsche Welle | 22.09.2010". Deutsche Welle. http://www.dw-world.de/dw/article/0,,6031138,00.html. Retrieved 15 September 2011. ^ "Radio BIR". Bir.ba. http://www.bir.ba. Retrieved 5 April 2012. ^ "Information of the University Sarajevo". Unsa.ba. 16 December 2007. http://unsa.ba/s/index.php?option=com_content&task=blogcategory&id=13&Itemid=43. Retrieved 5 April 2012. ^ Sarajevo Canton, 2000 Primary Education & Secondary EducationPDF (1.28 MB). Sarajevo 2000, p 107–08. ^ "Ecole française MLF de Sarajevo : News". École française MLF de Sarajevo. http://www.efmlfsarajevo.org/news/news.php. Retrieved 19 January 2010. ^ "Haggadah.ba - About the Sarajevo Haggadah". Haggadah.ba. http://haggadah.ba/?x=1. Retrieved 28 March 2012. ^ "Sarajevo Film Festival — Filmski Festivali — Filmski.Net". Filmski.net. http://www.filmski.net/festivali/25/sarajevo_film_festival. Retrieved 1 November 2008. ^ Special Olympics, (2005 – Quarter 2). 2009 Games in SarajevoPDF (277 kB) Spirit. Retrieved on 5 August 2006. ^ Hem, Brad (29 July 2006). Idaho may be in the running to host the 2009 Special Olympics Idaho Statesman. ^ Phone Web (9 June 2011). "CISM — Conseil International du Sport Militaire — International Military Sports Council". www.keezmovies.com. http://www.cism-milsport.org/eng/003_SPORTS/019_skiing/main.asp. Retrieved 15 September 2011. Bollens, Scott A. (2007). Cities, Nationalism, and Democratization. Abingdon: Routledge. ISBN 0-415-41947-6. http://books.google.com/books?id=lELpt_A7REkC&lpg=PP1&pg=PA95#v=onepage&q&f=false. Markowitz, Fran (2007). "Census and sensibilities in Sarajevo". Comparative Studies in Society and History 49 (1): 40–73. DOI:10.1017/S0010417507000400. Markowitz, Fran (2010). Sarajevo: A Bosnian Kaleidoscope. Urbana, IL: University of Illinois Press. ISBN 0-252-07713-X. http://books.google.com/books?id=OkQ5bS095egC&lpg=PA80&pg=PA83#v=onepage&q&f=false. This page uses content from the English language Wikipedia. The original content was at Sarajevo. The list of authors can be seen in the page history. As with this Familypedia wiki, the content of Wikipedia is available under the Creative Commons License.